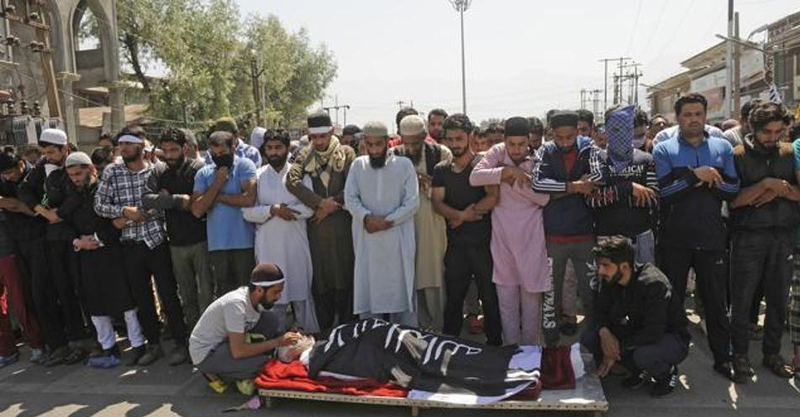 Protest erupted in Srinagar on Saturday as security forces allegedly fired shotgun pellets and tear gas at hundreds of people who had come to attend the funeral march of a man who was run over by a paramilitary vehicle the previous day. Associated Press reported that the angry mourners were taking the body to a graveyard in defiance of a government order banning the assembly of over four people when they were stopped by security personnel. Even as further protests erupted, police took custody of the body and allowed only a handful of the victim’s relatives to conduct the funeral. Meanwhile, police said they have booked the CRPF driver under sections 279 and 337 of the RPC for rash driving. They have also lodged a case against unidentified stone-pelters for rioting and attempted murder in connection with the violence that erupted in the city on Friday. Police said Ahmad and Kaiser were run over when scores of protesters began shouting anti-establishment slogans and attacked security personnel outside Jamia Masjid after the Friday prayers. According to CRPF public relations officer Sanjay Sharma, the vehicle was carrying SS Yadav – the second-in-command of the 28 Battalion. “They (protesters) came very close, and some even climbed on the vehicle. The protesters were trying to lynch those inside the vehicle, and the driver was only trying to get them out of the situation,” he maintained, adding that it was likely that somebody “might have come under the vehicle” in the heat of the moment. Even as images and a video of the incident went viral on the social media, former chief minister Omar Abdullah took to Twitter to condemn the incident. “Earlier they tied people to jeeps & paraded them around villages to deter protesters. Now they just drive their jeeps right over protesters. Is this your new SOP @MehboobaMufti sahiba? Ceasefire means no guns, so use jeeps?” he tweeted, along with a photograph of the deceased.